A seven year old infant from Haryana has been diagnosed with neonatal tetanus, as confirmed by a team of doctors at Post Graduate Institute of Medical Education and Research (PGIMER) in Chandigarh. This development is contrary to the confirmed issued by the WHO earlier that India is free of maternal and neonatal tetanus. 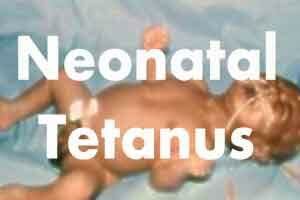 This neonatal tetanus case was the first such in many years. As reported by the Indian Express, Kurukshetra District Immunisation Officer Dr Anupama Singh said the likely cause of infection was “unhygienic practices” adopted by the family at the child’s birth. “During the delivery, the (baby’s) grandmother put some burnt cow-dung on the mother’s stomach. The mother also said the (baby’s) grandmother had cut the umbilical cord with a blade bought from the market,” Dr Singh said. The family had brought the infant to the Lok Nayak Jay Parkash Hospital in Kurukshetra after he refused to drink milk. “We were asked to go to PGI immediately. Doctors told me that my child has a disease,” Angad said. According to Haryana health officials, the child was admitted after there were complaints of seizures and stiffness of boy. “We provided the basic treatment and referred him to PGI. I have seen such a case after a long time,” said Dr Anupama Singh. The Health Ministry today issued a clarification regarding a section of the media suggesting that India had seen a resurgence of neonatal tetanus upon detection of a case at the PGI, Chandigarh. “A section of the media has reported regarding a case of neonatal tetanus at the PGI, Chandigarh. The present reported case does not change the country status of maternal and neonatal tetanus elimination (MNTE). MNTE is defined as less than 1 case of neonatal tetanus per 1,000 live births in all districts or equivalent administrative units of a country per year. The global definition provided by WHO and UNICEF explains that there exists a background rate of the disease which is so low that it is not a public health concern. India was validated for MNTE elimination in May 2015 and remains so,” a press statement by the Ministry said. Tetanus is medically reported to occur when a bacterium, Clostridium tetani, enters the body through an open wound or puncture. In a new born, it can be lead by unhygienic birthing practices. Use of unsterile instruments to cut the umbilical chord or treatment during pregnancy using contaminated dressings can be two such examples.